This article is a short summary of Pokémon Black and White Versions. 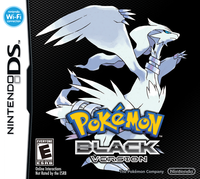 Pokémon Black Version (Japanese: ポケットモンスターブラック Pocket Monsters Black) and Pokémon White Version (Japanese: ポケットモンスターホワイト Pocket Monsters White) are the 18th and 19th main series Pokémon games released, beginning the fifth generation of the series. Unlike past games, which took place in regions modeled based on areas of Japan, Black and White take place in the far-off land of Unova, based on New York City in the United States, and unlike Generation III and Generation IV games, which take place at the same time as Generation I and Generation II, respectively, take place after the events of Generation II and Generation IV. Black and White begin much like most other main series Pokémon games. The player must choose their name and gender. They are then put in their house and their friends Bianca and Cheren come. A present is delivered containing the region's three starters, Tepig, Oshawott, and Snivy. Bianca will choose the starter whose type is weak to the player's, and Cheren always the one with a stronger type. The three battle, and the player's room is wrecked in the process. This page was last edited on 3 November 2018, at 22:50.